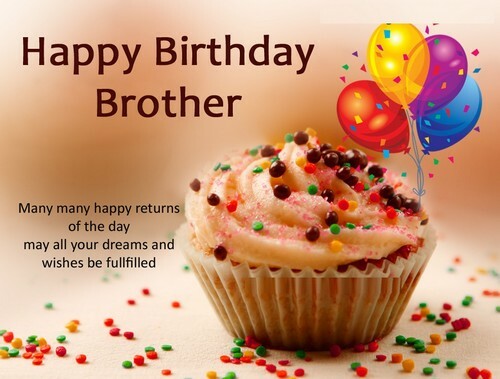 When you are in the mood to greet your beloved brother on his birthday, here are some of the SMS messages that you can send to help you decide on what to tell him. Just pick one of these and you are good to go especially if your brother knows how to appreciate the things that he is given. Happy birthday to you bro. You are the most optimistic person that I know of, do not ever change. No matter how much time passes by, I will love you because we are family, my dearest bro. To the boy who tries to conquer the world each year of his life, my brother, best bday! 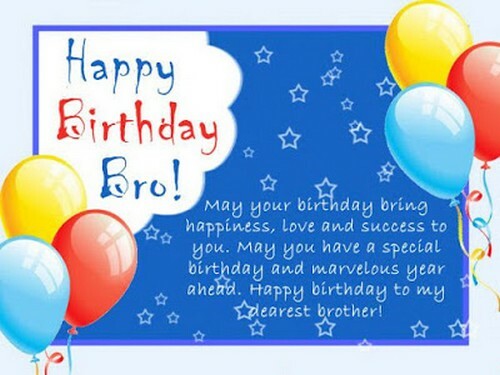 If you do not know it yet, every birthday of yours is special to me too, my dearest brother. You have longed lighted up my world ever since you came into my life, happy birthday, bro! I just want to take this moment to greet you a best bday, bro and to thank you for all. I hope that all of the dreams you have will come true, happy birthday to you my brother! You are my definition of what childhood should be like, thank you, bro and happy birthday. I feel so honored and lucky that you are my brother, just letting you know. Wonderful bday! You are the person that knows whenever I am not feeling okay, happy birthday big brother. The things you have done for me has amounted to so much, thank you and wonderful bday! For always teaching me something new every single time, thank you and best birthday! Another birthday comes your way and know that I will always be here, wonderful birthday to you! I will throw you the most awesome party you ever had in your life, brother. Happy birthday! There are times when I just cannot take the thought of you being away, I miss you brother. I hope that you will like the give of love that I will give you on your birthday my lil brother! I cannot wait to see you again and celebrate your birthday together, my big bro, see you soon! The best thing about you is the way you would always give me treats so for just today, let me be the one to treat you somewhere nice because it is your birthday after all, bro. 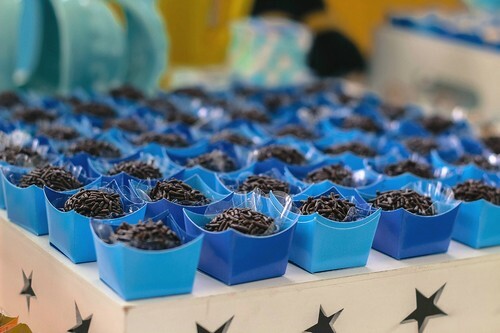 I will throw you an awesome party even when you are not here, best birthday brother! Let us keep on creating new heights, new ladders to step upon, happy bday brother! I know that you will always do the things that are right when it is hard, happy bday bro! Dearest big brother, you do not know how proud I am of you. Happy birthday to you today! You can never choose who your family is but I love you nevertheless, wonderful birthday bro! In the end of it all, you are still my brother and you always will be. Best birthday to you! I choose to stay beside you until the end of it all, happy birthday to you, my dearest brother! I have always admired the little things about you like how you are always determined to do the tasks you are given. Happy birthday to you, my dearest brother! You encourage me to be a better person and I thank you for that until today. Have fun today! No matter how old I get I will always be proud to be your little sister, wonderful bday to you. You have always cheered me up whenever I was down, happy birthday to you, my brother! I may not have the perfect gift for you at this moment but I love you and that is what truly matters, right? Best bday to you, my big bro! You have this cute sister that is rooting for you to do the best in everything, best bday! Big bro, may you always try to find out the truth even when it hurts so much, have fun today. You deserve the best birthday ever because you are the best person, big bro, I love you so! I may not always say it but you matter so much to me and I love you, big bro. happy birthday. 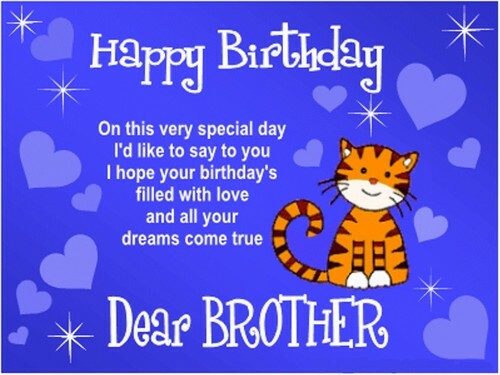 You are my favorite brother for you are the only one, happy birthday to you, enjoy your day! Just know that you will always be here in my heart even when you go far away, big brother! Little brother, I hope you realize that you matter to me. Enjoy your day and keep smiling. I wish that I could keep you happy for the rest of your day, wonderful bday to you my brother. 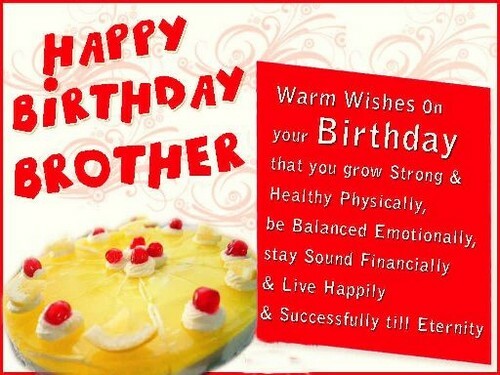 Needless to say, I know I am your favorite sister, so happy birthday to you, my dearest bro! My love for you, brother is so much wider than the universe itself, best birthday to you! 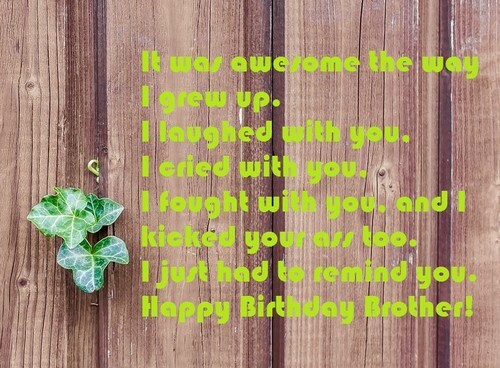 If I had a chance to pick who my brother would be, it would still be you, wonderful birthday, bro! There were some times when I did not want to be with you but I still cared for you, bro! Even when you think that I hate you, the truth is I care for you more than you think I do, happy bday to you, my dearest brother. You may not be the best epitome of a brother but you are perfect for me. Happy birthday, bro! I just want to tell you that it was awesome to be able to grow up with you. Happy birthday! Thank you for not being a good role model do I can be who I wanted to be. Happy bday. You have brought me so much happiness than you take credit for, bro, happy birthday to you! Every night, before I go to sleep I still thank God for giving you as my brother. Enjoy today! Today, I hope that you get to have as much fun as you can get. Wonderful birthday to you, bro! Throughout the years, you have always protected me, thank you and best birthday, brother! I do not think I would survive childhood if you were not there, big brother, happy birthday! I wish that you get the things that you have hoped for because you deserve it, happy birthday. God gave you to me and you are the best gift I have ever received, happy birthday, brother! I am thankful that mom did not listen when I told her to give you back to the doctor when you were born. Wonderful bday to you, bro! There are not a lot of people that are friends with their brothers, I am glad I am, thank you! You are the reason I am so into guns and blood, thank you so much, bro, best bday! 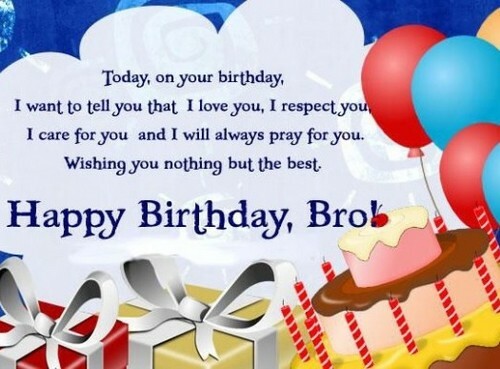 I want to show you how special you are to me, bro, best bday to you and have fun! 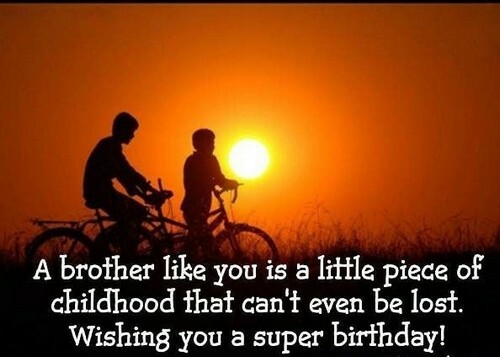 I hope that you never get to experience what sadness is, my little brother, best birthday! I will take away all the pain you feel if I could, my brother, wonderful birthday to you, today! You have grown another year older today but you will always be young at heart and I know that. I love you and happy bday to you, brother! To my dearest, most beloved brother, you are the reason I wake up early every day, happy bday to you and keep on making the most out of life. There is a reason why God gave you to me to be my brother and that is to make me happy. So let me greet you a wonderful birthday on your special day today. I may not often show it but know that I love you and I will always love you no matter, brother. Today is your birthday and I just want you to know that I will do anything for you, brother. We may fight like crazy but at the end of the day, we still love each other, my dearest brother. Whenever I remember our childhood days, I want to see you again, wonderful bday big bro! You know the bro code more than me and I will uphold just that, best bday little bro! You are my life support, the one that keeps me alive, happy birthday to you, my little brother! You are my happy place and I thank dad and mom for you, best bday to you, big bro. I have longed realized that you are special to me and I hope you do to, happy birthday, bro. You are the light at the end of the tunnel, the one that makes me happy, happy birthday, bro. You are more than I have asked for and I still thank you for that. Wonderful bday to you. We may be opposites but you are awesome and I love it, happy birthday to you my brother. No matter what life may throw at you, I will always have your back. Best birthday, brother. You are the one person that I keep on looking up to no matter what, wonderful birthday, brother. I want to tell you that I am laughing at you right now and I appreciate you, brother, so enjoy your birthday and just tell me you love what I did. All the things that you did for me in the past, I still thank you every day for them, brother.